A flattering, narrow waist and feminine, full length skirt offset by lace sleeves and a darling satin sash make this dress a subtle knockout. 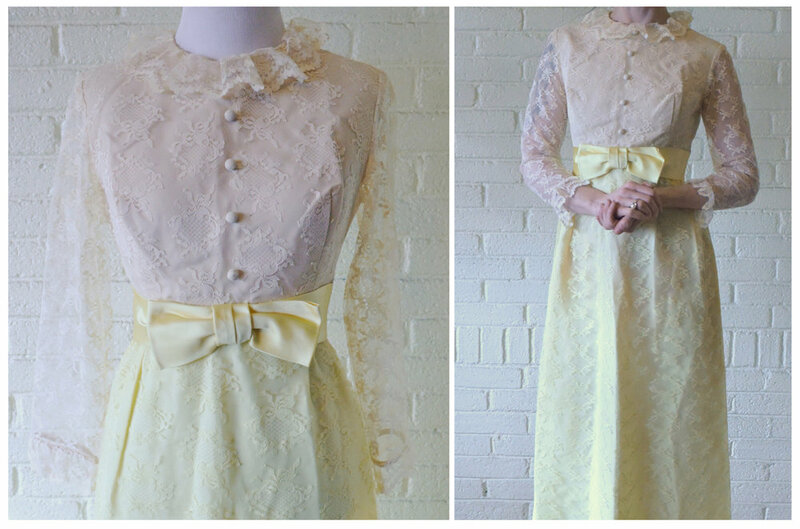 I invite you to scroll down to see images of the 1960s Lemon Drop Dress in greater detail. Materials: Taffeta underlay with lace overlay and satin band/bow. All three materials are possibly nylon blends. Colors: Ecru and lemon yellow. Closures: Single back zipper with three hook-and-eye closures, one at the back of the neck and two on the band. The sleeves have an elastic band sewn in along the wrist. The four bodice buttons are decorative. This piece is in fantastic shape and I question whether it has ever been worn (if so, not many times I should say!). The rating, then, relates to two very minor spots on the band, one on the back, lower right side and the other on the front, left side of the bow. Both are quite small. Additionally, while it works perfectly well, the zipper must be employed with care, as its no spring chicken. If this applies, note that the sleeves look rad with tattoos underneath them!